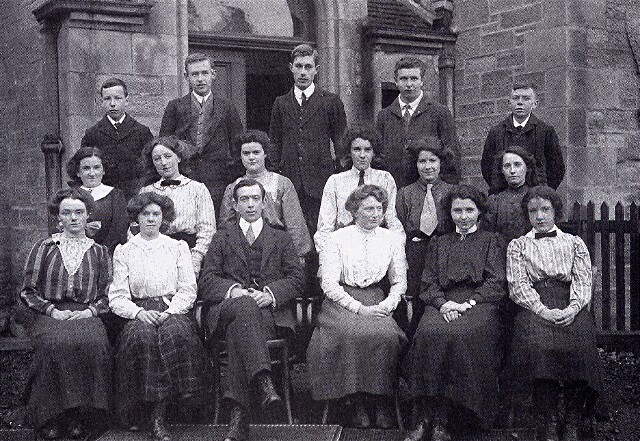 Invergordon Academy Higher Grade II (6th year) in 1911. Back row: A.W. Sutherland, A.W. Macdonald, A.L.Philips, George Ross, W. Macdonald. Middle row: Julia Ross, Hilda Bain, Jean Macrae, Jessie K. Ross, Kathleen Macrae, Nellie Littlejohn. Front row: James Annie Holm, Netta Fraser, Mr. Addison (Principal Teacher of Maths and Science), Chrissie Logan, Ella Macdonald, Chrissie Ross. I think that the George Ross, 4th from the left on the back row was my maternal grandfather and the father of Julia Ross (my mother) 6th from the left in the middle row of picture #1188. Her sisters Chrissie Ross is 4th from the left middle row and ivy Ross, 1st on the left front row.